Sage promotes digestion and regulates your appetite. Plus, it serves as a wonderful natural cure for menstrual problems. In addition, this herb with soft, green-grey colored leaves improves your mood as well as memory. It is also used as a seasoning for various dishes. Basically, this shrubby herb has a strong flavor and peppery taste. It helps improve health due to its effective antioxidant qualities. Scientific Name: Salvia officinalis L.
This is native to the Mediterranean region. It belongs to the Lamiaceae family. Sage or common sage has stimulant, carminative, antiseptic, astringent, anti-inflammatory, anti-spasmodic, anti-bacterial, anti-fungal, febrifuge, expectorant, sedative, and diuretic properties. It is useful in curing sprains and swellings. In addition, it assists in the natural treatment of cough, sore throat, tonsillitis, laryngitis, and other respiratory infections. Sage is also helpful in relieving mouth inflammations and gum problems. Moreover, this cooling herb helps suppress excessive perspiration and night sweats. Researchers have found that extracts of this herb greatly benefits patients suffering from Alzheimer’s disease by improving their cognitive function. 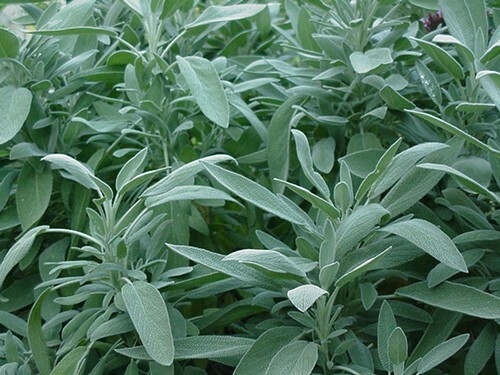 Plus, being rich in flavonoids, sage assists in reducing the risk of developing certain cancers. It heals digestive disorders such as bloating, indigestion, intestinal spasms, gas, diarrhea, heartburn, gastritis, and so on. 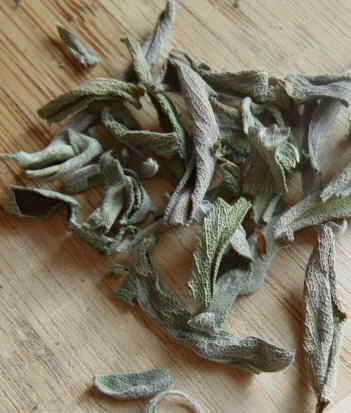 Furthermore, sage is considered as an excellent herb for improving your memory and concentration. It provides relief from nervousness, anxiety, and depression as well. Sage is considered highly beneficial home remedy for menopausal disorders and symptoms like hot flashes. Moreover, it strengthens the nervous system and helps in treating liver disorders. This herb guards against the depletion of a neurotransmitter called acetylcholine which is important for proper brain function. Watch this video giving information on sage herb and how to use it while cooking. In terms of nutrition, sage is packed with vitamin A, vitamin K, iron, calcium, potassium, etc. It contains volatile oils including eucalyptol, thujone, and camphor. You can take this herb in the form of herbal tea. Sage capsules, tinctures, and essential oils are also available. Plus, you can add this herb, preferably fresh, in foods while cooking. 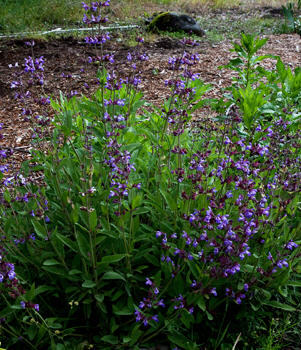 When drying sage leaves, keep them out (in the shade) but do not expose them to direct sunlight. • Brew one or two teaspoons of dried sage leaves in a cup of hot water for 10 minutes. Strain the fluid and then use it for gargling to relieve sore throat. • Prepare sage tea by steeping two teaspoons of crushed sage leaves in a cup of boiling water for about 15 minutes. Cool and strain the liquid. Drink this sage tea three to four times in a day to control night sweats and hot flashes. • Those who are suffering from diabetes can take sage infusion on an empty stomach to lower blood sugar levels. It is suggested that you monitor your blood sugar carefully while following this home remedy in order to avoid hypoglycemia. • Sage promotes sleep and relaxation. For this, you can make a sage pillow by filling dried sage leaves in a small pillow. Plus, you can have sage tea mixed with lemon juice and sweetened with honey. • Regularly drinking herbal tea prepared by boiling one teaspoon each of sage and mullein leaves in a cup of water is beneficial in dealing with asthma. You can also inhale the steam of this infusion when it is hot. • Another health benefit of sage tea is that is helpful in increasing appetite, especially when consumed daily. Hence, it is good for people suffering from anorexia. It also purifies blood. Furthermore, it eliminates intestinal gas and aids in digestion. • Steep about three grams of sage leaves in 150 ml boiling water for 10 minutes. Cool and strain the solution. Use this liquid as a mouthwash to heal issues like gingivitis, mouth ulcers, cold sores, canker sores, tongue sores, etc. • Boil a cup of water, add some sage leaves and fennel seeds in it and leave it covered for about 10 minutes. Finally, strain and drink it as tea to reduce throat infection. You may also gargle with it. • To cure fever naturally, boil a tablespoon of sage leaves in a cup of water for 10 minutes and drink half a cup of this solution (after straining) once or twice throughout the day. • It is believed that drinking one or two cups of sage tea regularly for a few days inhibits milk production by mammary glands. • Drinking sage tea a few times in a day helps ease menstrual cramps. • As sage darkens hair color, it can be used to darken grey hair. For this, you need to apply sage infusion (rosemary leaves can also be added) on hair about 5-10 minutes before shampooing. Follow this procedure at least once a week for a few weeks. Regularly rinsing your hair with this solution also makes your hair grow faster. • You can add sage essential oil in olive oil, coconut oil, or jojoba oil and massage your scalp with this mixture to promote hair growth and strengthen your hair. You can add sage infusion in your shampoo as well. • Drinking sage tea and massaging aching joints with diluted sage oil relieves rheumatoid arthritis. It soothes the sciatic nerve, too. • Soaking a cloth in sage tea and placing it on the forehead helps in getting rid of headache. Rubbing fresh sage leaves on teeth and tongue works as a natural breath freshener. It benefits bleeding gums, too. In addition, applying juice squeezed out of fresh sage leaves helps cure insect bites. It is believed that this herb also possesses spiritual properties and hence, it is considered sacred in certain cultures. It is suggested to avoid using this herb as a medicinal remedy during pregnancy as it can stimulate uterine contractions. Sage does not cause any considerable side effects. However, it may raise the blood pressure in certain individuals. Plus, the chemical thujone present in this herb can have give rise to toxic effects if it is taken for a long time. Thus, those who have seizure disorders should not take sage in excess or for prolonged periods. Besides, when using sage essential oil, make sure you dilute it in water or any massage oil before applying, or else it can irritate the skin. The oil is not supposed to be ingested. This is helpful but it does not tell you what to do or how to make it so that it improves your memory? you could get herbs that are babies and aldarey planted at garden centers at places like lowes or home depot.or you could start with seeds and plant them in some planters with some good soil and some water, with the sun coming it’s perfect time to start one. start with basil, or rosemary. be sure to label all of your pots. DO NEEEM, EUCALYPTUS AND LEMONGRAAS ALSO COOL THE BODY AND DEAL WITH EXCESS PERSPIRATION? DO THEY HAVE BENEFITS FOR THE SKIN?